Home > Stuff for Mums > Shopping > Why do you need a Coolpod? As the holidays come to an end, kids and parents alike are starting to gear up for the upcoming school year. This is where Coolpod comes in handy. 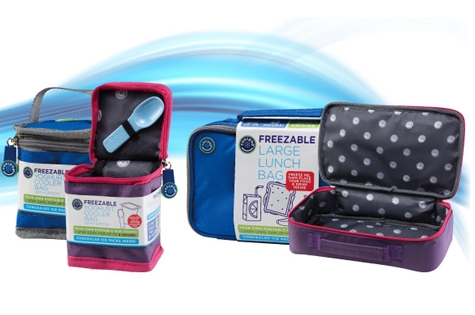 The Coolpod is a revolutionary and innovative range of cooler bags that can keep food and drinks cold for up to 8 hours. You read that right, moms and dads! No more worrying about food getting spoiled or drinks not tasting good anymore because Coolpod can keep them cool for 8 hours. What's more is that the Coolpod is a budget-friendly option for parents with bags retailing at $7.95! Yoghurt Pouches for your child's yoghurt squeezes. Yoghurt Cooler Bags which can hold up to a 200g container yoghurt. Lunch Cooler Bags for school and office lunches. These are available in square, rectangular, and round sizes. Drink Cooler Bags that can keep your favourite drink cool for up to 8 hours. These are available in fruit box containers and smoothie bags. Wine Cooler Bags to keep parents' favourite drink cool, of course. Why do you need a Coolpod? 1. It can keep your food and drinks cold for up to 8 hours! What more can you ask for?! 2. It's safe! The inside of the Coolpod is made of non-toxic, FDA approved Nylon lining. The coolant ice packs are made of non-toxic, purified gel in durable bags. 3. It's simple to use. Just place the freezable bag inside the freezer overnight and it's ready to roll come morning. 4. It's easy to clean. Got a spill? The outside material of the Coolpod is made of Durable Nylon. All you need to do is wipe it with a damp cloth then place it back in the freezer for the next use. 5. It's affordable! The Coolpod starts at $7.95. What a deal! You can purchase your own Coolpod from https://www.coolpod.com.au. Delivery is free for orders over $60!